Just like that, fashion month has come and gone. New York, London, Milan, and Paris educated us on the latest runway trends, and the attendees educated us on the latest street style looks to try. While there were countless days filled with hundreds of standout looks, we took it upon ourselves to identify a small handful of our favorites for you right here. The seven street style looks ahead not are only some of the best we've spotted individually, but they also represent larger outfit themes we've noticed from city to city. What we are most excited to report after carefully studying the most eye-catching street style looks this season is that the dressing is getting a lot more approachable. The whole more-is-more stigma that's usually associated with street style has (for the most part) faded away, and practical pieces are taking center stage. From buttery leathers to all-beige ensembles, get ready for the roundup of street style looks we loved the most, including all the shopping guidance you'll need to copy each. Elements of high shine, whether via leather, vinyl, or silk, as shown here, crept their way into the outfits of street style stars all around the world. The key to pulling off a glistening look is to one, mix and match textures for a more well-rounded feel, and two, accessorize minimally. We recommend simple, everyday jewelry such as gold stacking rings or subtle hoops and classic carryalls. Grandma dressing is the trend that keeps on trending. What started with the rise of ladylike bags and silk scarves has quickly escalated to oversize ruffled collars, lace tights, and cozy cardigans. Essentially, when it comes to this way of dressing, if it looks like it could have come from the depths of your grandmother's closet, put it on. 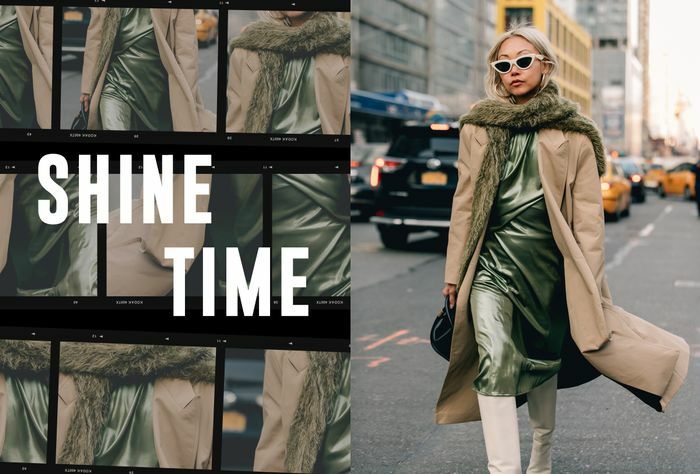 This fashion week, attendees stuck to leathery separates like glue, opting for belted trenches, buttery trousers, and all the accessories to match. The look featured above takes luxe leather to new heights, leaving no room for any other material to shine, and in this case, that's an approach we're championing. When it comes to styling leather looks, the variations are endless, but this Matrix-inspired getup, in particular, is giving us all the feels. What's splotchy and swirly and retro all over? The tie-dye trend, of course. This nostalgic pattern has been taking the sartorial world by storm, and it's thanks to fashion month and the street style stars in attendance that we now have a clearer idea of how to wear the trend IRL. From dip-dyed jeans to multicolored tie-dye tees, this is one trend that has quickly turned your everyday basics into something spectacular. Ask any editor, influencer, or celebrity, and they will quickly admit to the weather during fashion week being particularly horrid. If it's not sweltering temperatures in New York, it's massive rain storms in London, and this year, attendees were ready for anything, especially the rain. Street style stars arrived at the shows decked out in vinyl bucket hats, raincoats, and wellies galore, but this coordinating duo made us want to buddy up and dress for wetter days stat. News flash: Beige is no longer boring. In fact, the more of it you wear at once, the cooler you'll become, at least according to the street style stars. This whole notion of wearing as many neutral colors at once has turned into somewhat of a lifestyle, starting with the rise of the #StickofButter clan on social media and ending with, well… To be honest, there really isn't an end in sight. Vintage lovers, this one's for you. Heritage handbags—whether you're opting for the latest version of the Fendi Baguette Bag or stalking The RealReal for the best price on a Dior Saddle Bag—are officially the biggest handbag trend of the year. Every major luxury house from Prada to Gucci is churning out bags that are reminiscent of ones you've either had or will have for years. The Prada Sidonie was particularly popular this fashion week, alongside the new Chloé C Bag and many more.